The “Gibbs Dope Trap” is the common steel trap to which has been added a device for applying a hypodermic injection to a trapped animal, relieving pain instantly and killing it quickly. An arm which rises above the trap when it springs, encircling the leg caught in the trap, carries a hypodermic syringe and is mounted on a slide. The trapped animal, pulling to escape, applies the injection to itself. There is absolutely no danger to the user. The pull of the animal is not on the trap grip. It comes on the syringe arm and the animal cannot pull out. The hypodermic syringe was discontinued quickly for unstated reasons. An advertisement that ran two months later instead describes a capsule that releases poison when the animal bites into it. W.A. Gibbs patented the trap in 1932 (capsule version, not the hypodermic). It was made in No. 3 and No. 4 and Gibbs stated it could be made in other sizes, if desired. Some No. 4 traps have holes or teeth in the jaws, three on the loose jaw and two on the dog side. Before entering the trap business, Gibbs was an electrical engineer. After he retired from that field, he bought a marsh on the Eastern Shore of Maryland to serve as a duck hunting preserve. However, the marsh was densely populated with muskrats, and he soon had employees trapping them for the fur market. 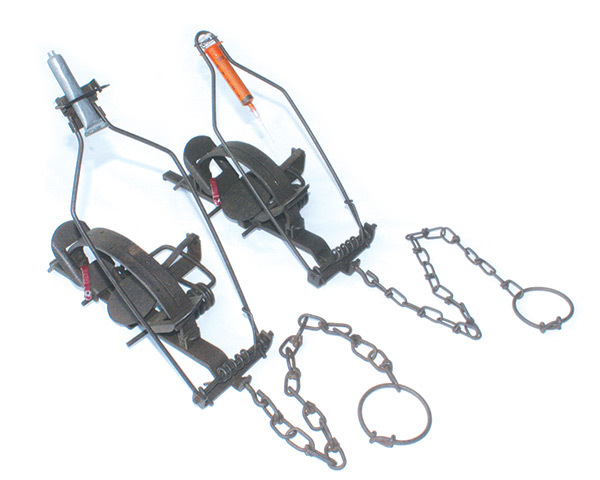 Not satisfied with the traps on the market—mostly because of the way muskrats could escape them by wringing off—he began making traps of his own design, including the “Two Trigger,” which became a standard of the industry. W.A. Gibbs patented at least 26 trapping devices in addition to the Dope Trap. The No. 3 or No. 4 Dope Trap in complete original configuration and good collector condition may command as much as $1,500. It is a rare find today, however, because most trappers thought it worked better without the poison and either altered the bail assembly or removed it altogether.